Hydrotherapy means simply ‘water therapy’. 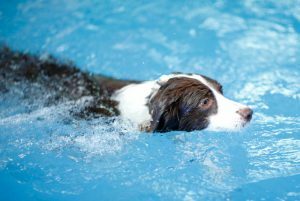 There are many benefits to be gained by exercising in water, and it forms an essential part of the rehabilitation program of many of our small animal patients. 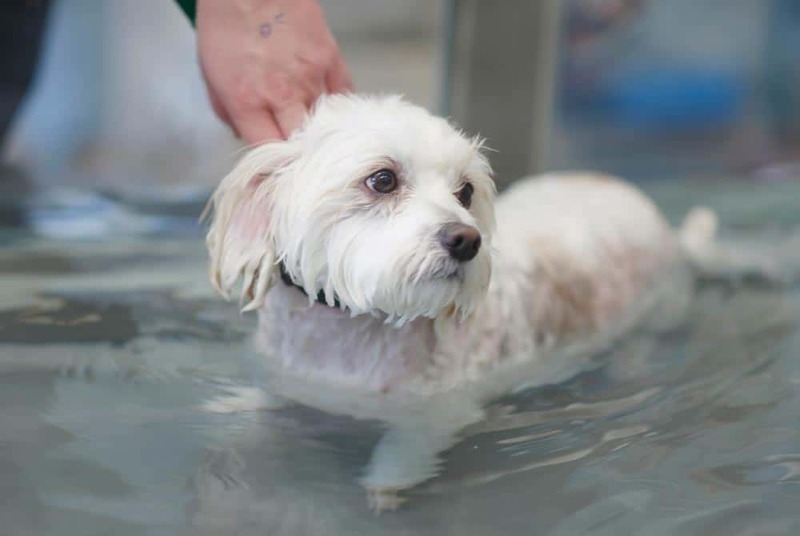 Pets that receive hydrotherapy as part of their rehabilitation program continue to demonstrate accelerated recovery and return to function compared to those receiving a home exercise program alone. Research shows that underwater treadmill therapy can speed muscle strengthening and improve joint range of motion in dogs following surgery. Benefits can be gained in as little as 1-2 sessions per week. Why choose Dogs In Motion for hydrotherapy? Your pet deserves to exercise in water maintained at the highest standards, and to receive treatment provided by experienced therapists. Staff at our facilities, are all trained in water quality maintenance. In conjunction with computer controlled water sanitisation, we also hand test and treat the water twice daily to ensure it stays super clean. All our therapists are experienced in the provision of hydrotherapy services for dogs with various conditions. Programs are devised specifically for your pet’s individual needs and stages of healing, to help meet their rehabilitation goals faster. 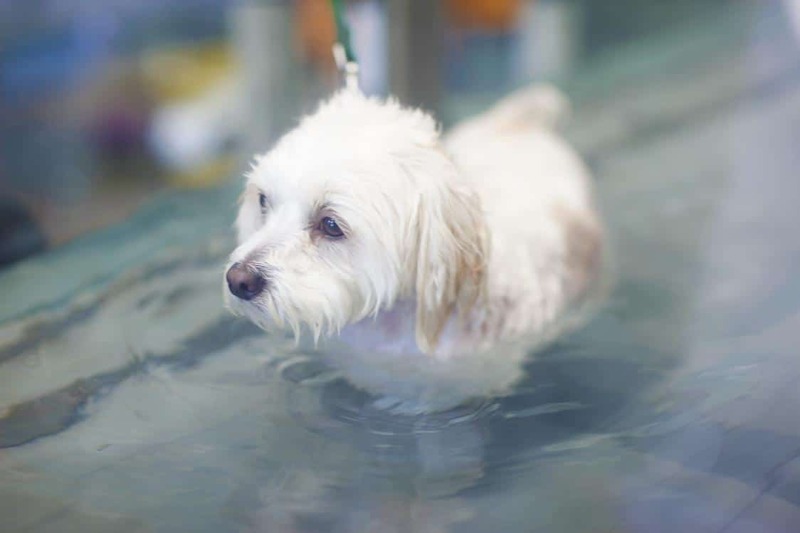 With over 10 years of hydrotherapy experience, more than 60,000 dogs have swum in our pool and more than 20,000 dogs have exercised in the underwater treadmills. At Dogs in Motion, we know a thing or two about hydrotherapy, and we will design a program to suit the needs of your pet. Ready to book a hydrotherapy for your beloved best friend? Underwater Treadmill therapy is the most common type of hydrotherapy we use at Dogs in Motion. We installed the first underwater treadmill for dogs in Australia in our Doveton clinic in 2003 and have since installed 2 further treadmills in veterinary specialist clinics. A physiotherapy assessment is required for all pets before they can commence underwater treadmill therapy. Please contact us to discuss your pet’s needs. Swimming is a unique form of therapy as it combines joint range of motion, gentle muscle endurance and strengthening, improved circulation and cardiovascular conditioning without weight bearing. We often use swimming as part of the rehabilitation program for our spinal injured patients, to help improve awareness of limbs and assist in return of neuromuscular function. We can recommend a suitable dog swimming pool if following your initial assessment, we decide this therapy would be required for your dog. Dogs recovering from orthopaedic or soft tissue injury or surgery, or those with chronic conditions will often start with underwater treadmill in the acute stages of rehabilitation when we want to accelerate strengthening, and in the later stages of rehabilitation as they are improving, move onto swimming. This is because swimming is more vigorous and we have less control over the intensity of limb movement. It is also more of an endurance type exercise and we get less rapid gains in strength and muscle mass than with underwater treadmill. In pool assisted hydrotherapy is usually required for the severely affected spinal patients, that are non ambulant on land, are unable to walk in the underwater treadmill, and aren’t safe enough to swim unassisted. It’s important that your pet checks in with their physiotherapist regularly. We need to ensure your pet is progressing with their rehabilitation and update their home exercise program as they improve, so as to reach their goals faster. We are also able to identify if they are not progressing as well as we would like, alter their program to suit their rate of recovery, or refer them back to the vet if required.